In the picture above, north is at the top and the image covers 29.5 x 36.9 degrees. Image centre is located at 14:10:37.4, -64:06:28 (H:M:S, D:M:S, J2000) Astrometric data from Astrometry.net. Circinus (the drawing Compass) is an inconspicuous constellation introduced by the French astronomer Nicolas Louis de Lacaille, who observed the southern sky from the Cape of Good Hope between 1750 and 1754. He named 14 constellations, many of them associated with science or navigation, such as Microscopium and Telescopium, Octans the Octant and Antlia Pneumatica, the air pump. Circinus contains no bright or named stars and covers 93 square degrees, making it the fourth-smallest. Triangulum Australe is the southern hemisphere counterpart of Triangulum. It is a bigger constellation and contains brighter stars than Triangulum and it never sets for most of Australia. 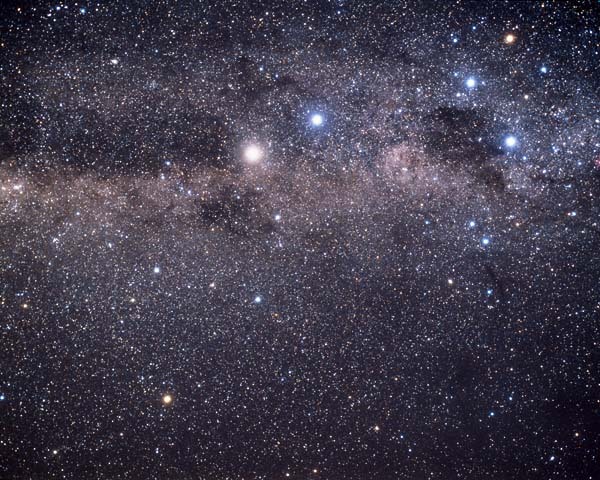 Its brightest star is named Atria (for alpha Trianguli Australis), in the manner of Acrux in the Southern Cross. It is easily seen near α and β Centaurus. Crux and Musca have their own pages. Constellations adjoining Triangulum Australe: Apus, Ara, Circinus, Norma.